NEIL SEERY WILL not end his distinguished career at UFC Fight Night 99 in Belfast this weekend, as had been expected. 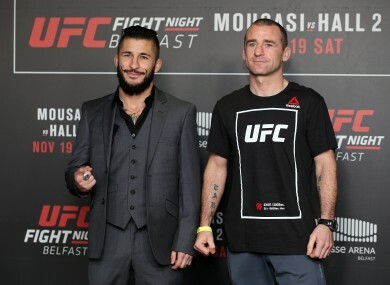 One of the country’s finest and most experienced MMA fighters, the 37-year-old was pencilled in to face Ian McCall in a flyweight bout — his seventh in the sport’s elite promotion — at the SSE Arena tomorrow night. It was to be the Team Ryano man’s last competitive fight as the Dubliner announced back in September that he is hanging up his gloves. However, their preliminary card match-up will not be going ahead as McCall has withdrawn a day before the event due to illness. The American, ranked fifth in the division and nicknamed ‘Uncle Creepy’, hasn’t fought since January 2015 as his opponent Justin Scoggins failed to make weight at UFC 201, before Ray Borg pulled out of his next scheduled bout ahead of UFC 203. Seery made weight at 126lbs and will subsequently still receive his show money from the UFC. He also confirmed that his retirement plans will now be pushed back as he intends to fight one more time before bringing an end to an 11-year professional career. Email “Heartbreak for Seery as farewell UFC bout suffers late cancellation ”. Feedback on “Heartbreak for Seery as farewell UFC bout suffers late cancellation ”.